Dogs and humans are social creatures, and now that summer has finally arrived in Chicago, Chicagoans can get social with their pups at four area dog-friendly watering holes. Returning for its fifth year, having taken a break in 2014, Mahoney’s Pub & Grille http://mahoneyspubchicago.com, home to a large, dog-friendly patio, will partner with three other West Town bars, also with dog-friendly outdoor areas: Aberdeen Tap http://www.theaberdeentap.com, G & O Tavern http://grandandogden.com, and The Matchbox http://thesilverpalmrestaurant.com/TheMachBox.php to host a weekly yappy-hour called the “ West Town Pup Crawl”. It will take place every Tuesday evening from 6:00 p.m. to 9:00 p.m., beginning on Tuesday, June 16 through Tuesday, October 6, 2015 , patio weather permitting. Returning as host of the West Town Pup Crawl will be Jessica Abernathy of Chicago Canine Concierge http://www.chicagocanineconcierge.com. Abernathy will bring together a different dog rescue group every week, such as Chicago Animal Advocates http://www.chicagoanimaladvocates.com and Bow Wow Revolution https://www.facebook.com/BowWowRevolution, along with dog-centric vendors such as Your Pet Chef http://www.yourpetchef.com/ and Canine Sports Dog Training http://www.mycaninesports.com, to provide services and goodies during the Pup Crawl at Mahoney’s Pub & Grille. For more information on each week’s shelter and service provider, please visit www.ChicagoCanineConcierge.com. 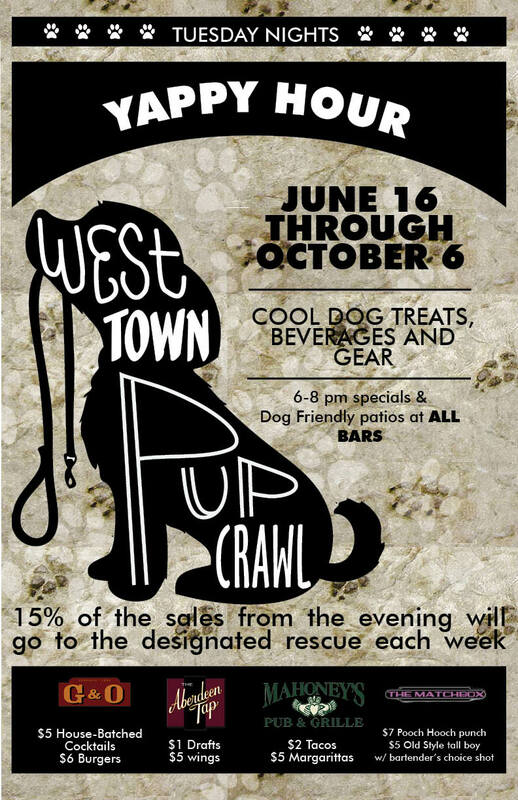 The West Town Pup Crawl is free of charge to leashed, friendly dogs and their unleashed, friendly owners. All participating bars will feature a food and drink special and plenty of fresh water for the pups, including an alcohol-free beer made just for dogs called Bowser Beer, at Mahoney’s. From 6pm to 8pm, 15% of Mahoney’s Pub & Grille bar sales proceeds will benefit the featured rescue group of the week. Mahoney’s Pub & Grill will offer $2 tacos (chicken, steak, or pork) with $5 Margaritas and $5 Bowser Beer for Dogs http://bowserbeer.com. Mahoney’s Pub & Grille is located at 551 North Ogden Avenue in Chicago. The Aberdeen Tap is located at 440 North Aberdeen in Chicago. G & O Tavern is located at 1367 West Erie in Chicago. The Matchbox is located at 770 North Milwaukee Avenue in Chicago.